Dr. Valente obtained a postgraduate education as a Board Certified Chiropractic Sports Physician by the American Chiropractic Board of Sports Physicians. This certification is specific to physical fitness and the evaluation and treatment of injuries encountered in sports. Dr. Valente graduated from Texas Chiropractic College in Houston, Texas, with a focus on Radiology, Rehabilitation, and Myofascial Disorders. During this time he received a certification in Acupuncture and was trained in Concussion Grading, Athletic Taping and Kinesio Taping techniques. At the same time he joined the Baseball Sports Medicine Institute where he treated Professional and Amateur athletes. In 2001 he was a team doctor for the NIKE Pro-Am Basketball League for 6 years. 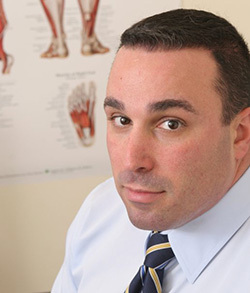 Dr. Valente specialties include: the treatment of neck and back pain, disc injuries and disc herniation, sports injury rehabilitation, pinched nerve, and nutrition. Dr. Valente is certified in FAKTR, which stands for "Functional and Kinetic Treatment with Rehabilitation." It was developed to help speed recovery from chronic musculoskeletal pain syndromes and has also been shown to work extremely well on acute musculoskeletal & myofascial conditions. This technique uses instrument assisted soft tissue and manual therapies, combine with Kinesio taping and various low-tech rehabilitation devices such as Thera-Band simultaneously. This approach provides a powerful stimulus to healing tissues. In 2006 & 2007, Dr. Valente was part of the medical team at the AVP Pro Beach Volleyball Tour in Brooklyn, NY. Dr. Valente has been quoted in Women's Health and the New Yorker magazines. Dr. Valente is a proud member of the United States Sports Chiropractic Federation which promotes the development and care of athletes at international sporting events. Posses specialized knowledge of sports injuries and physical fitness. Are experts in the function of the body during movement, from high-level athletics to everyday activities. Can help optimize performance enhancement by applying an advanced understanding of musculoskeletal function and athletic training. Offer individualized care that extend beyond spinal adjustment to include direct treatment of muscle and connective tissue. Focus on total body wellnes and reaching optimal functioning, not just reducing pain. Are immersed in the latest sports medicine research, trends and treatment techniques. Can integrate seamlessly with other healthcare practitioners to optimize your care. Are passionate proponents of physical fitness and skill sports medicine practitioners. Will help you achieve your peak performance with a breadth and depth of knowledge found only with their specific training. Comprise the top tier of the chiropractic profession. Serving patients in Midtown, New York.